You might think 8K is unnecessary, gratuitous, overkill and not for you ... until you watch NASA's stunning video from the International Space Station. 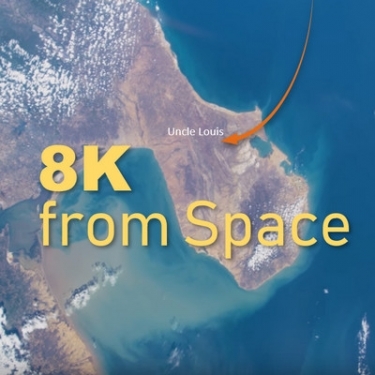 You can see Uncle Louis from space if you're shooting in 8K like NASA did here. If you think 4K with HDR delivers the best picture you could ever desire, then take a look at NASA's 8K footage from the International Space Station. Space buffs could stand right up to an 8K display and discern every little gizmo in the space craft. And the rest of us can ogle at the rich images of Earth from 239,000 miles away. True, few viewers will be able to appreciate the NASA video on anything approaching an 8K display, but the clarity and detail is remarkable, even on a 4K TV or monitor. Maybe we won't need or desire 8K displays for action flicks and rom coms, but documentaries and cinematographic wonders could seal the deal. As Jonathan Brawn of Brawn Consulting says, we were all happy enough with our images before 4K disrupted everything, “and we don’t see anyone debating why 4K was a good upgrade from 1080p, do we?" OK, funny, I was looking for Loui’s Lunch to see how long the line for burgers was, but they never flew over New Haven! The serious side of 8K is another story though. And now that we have JVC launching hardware at CEDIA, DPI demonstrating it on a DCi 4K chip projector XPR’d to 8K, and Sony doing a goofy demo with 2 projectors showing pseudo 8K images that looked worse than 4K if anything; I guess we’ll have to take up the topic. So, the 8K question is now put to our industry, and it may or may not cause consumers to put 4K in the obsolete category like they did 1080p 7 years ago, long before any 4K content even existed! That caused problems, especially in the residential cinema category where larger images and closer viewing distances were more likely to show the flaws in pseudo 4K sources and displays. The point made above, that we don’t see anyone debating if 4K was a good upgrade from 1080p, misses the mark when it comes to serious content, like the art of movies, and it ignores some historical facts as well. That debate did happen in 2 important places, and 4K lost in both. In the consumer market those side by side demos at Best Buy revealed the truth, pixel count is not the same as resolution. It became well known that people saw no benefit in 2160p over 1080p at normal viewing distances, 1.5 screen heights away or further. 2160 was most useful in touch screen displays and simulation where viewing distances aren’t TV based at 3H or more, or even cinema based at 1.5H to 3H. These were less than 1H, closer than the 1st row at any large format cinema. NASA’s need is closer to simulation, than cinema. It wasn’t until HDR with wide color gamut came along that people saw a benefit. And HDR is the driver for serious 4K residential cinema today because we now have great movie art coming from Hollywood worth reproducing accurately at home. Meanwhile, the marketers of the original 4K pixel count pitch admitted their earlier failure by saying ‘now everyone can really see a benefit’. The other place that put 4K to the test was professional cinema. Today 85% of all digital cinemas are 2K, and new systems still being deployed continue to see 2K dominate. Cinema’s creative entities used 4K cameras in the same way this NASA footage does. So, they can zoom in, (or in cinema’s case crop and edit), and still maintain 2K resolution afterwards. The vast majority of cinema exhibition is shown from 2K files, even when 4K projectors are installed….a dirty little secret perhaps? So, one could say ‘has anybody walked out of a current digital cinema and complained the image wasn’t sharp’. Unless the ‘projectionist’ messed up the focus the answer is no. And 85% of the time we’re seeing 2K! So now let’s launch another fake resolution benefit on an unsuspecting market, and tell them plenty of 8K content will be coming soon, just like we did in 2012 for 4K. Six years later the entire library of 4K movies on UHD can be displayed on a 10’ rack. The other 1000’ of rack space is for the HD brd’s. Let’s settle on 4K for awhile and resist taking consumers on another fantasy ride. Today with the Barco projection line we’re designing residential cinemas in 2K, 3K, 4K and 5K formats, and all are equally stunning visually, and true to the art and science of movies. In my executive role with James Loudspeaker, we’re also designing pre-engineered system solutions that bring Hollywood’s immersive sound standards to residential cinema designs. Put the sound and image together in a system that meets the standards of professional cinema, and you’ve got something truly exciting! Like a NASA video shown at a cinematic scale, or the original American Burger from Loui’s Lunch! The 8K topic should be red meat for us, and how we position for high end clients matters to business health. Here’s to best cinema at home. haha, I didn’t even check the link. You’re my new bff. Sorry? I loved your easter egg Julie. I posted it in the link in the first response for people who don’t know how to zoom all the way in on an 8K picture. Hope i’s OK to give away the secret. OK, so that makes one person besides myself that gets a kick out of silliness like this. Sorry you didn’t find Uncle Louis. I knew it wasn’t going to be Uncle Louis!